In the week since their release, the adidas COPA 19 has easily received more attention than any previous COPA model. They have been front and center with a lot of players wanting to know what this next generation model has to offer. In reality, it was the wake-up call the comfort silo needed, and has brought it back into the fold as a relevant boot option for dynamic players. What better way to really get to know a new boot than to talk to the people that actually worked on their creation. 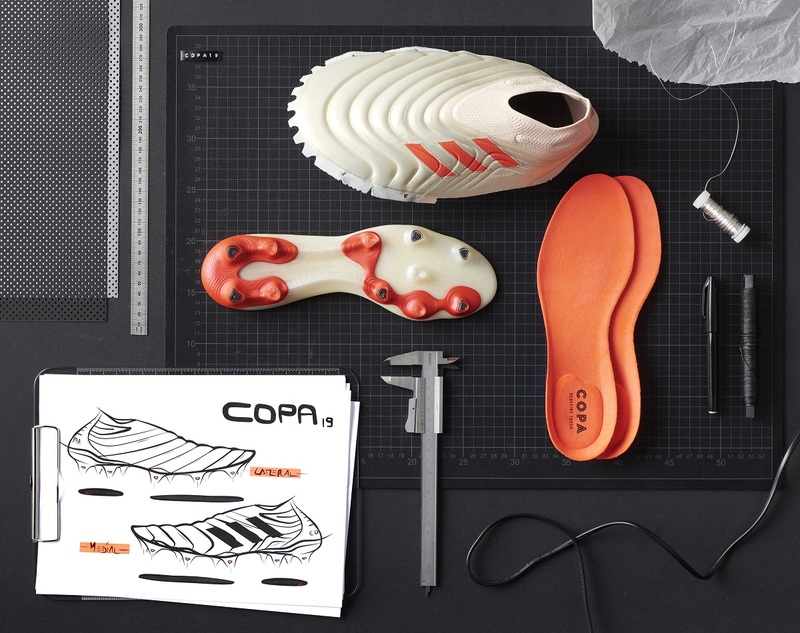 The following is a hard hitting Q&A with adidas Senior Design Director, Dave Surace, as he gives us the breakdown on where this latest design came from and what players should look to expect from COPA 19. I love this insight, as it gives you a deeper appreciation for what they are all about. Enjoy and let us know if you have any comments about them below. You can find all latest COPA 19 releases at soccer.com. What is the design inspiration behind the new COPA 19+? The COPA franchise isn’t just one of our most beloved products, it is a truly iconic part of footballing culture. Like many classic designs, it has remained popular through changes in style and trend, with a timeless aesthetic that is much-loved by football purists. We were inspired by other iconic designs that have evolved and adapted throughout the decades, combining new modern changes with classical looks to stay true to the original design. Our inspiration came from taking a classic product and infusing innovation and modernity, following our mantra of authenticity to progression. What is the COPA’s biggest technical innovations? The technical innovations of the new COPA fall into three categories – fit, touch and movement. In terms of fit; the internal construction, featuring foam pads and an ortholite sockliner, provides cushioning and comfort. The Sockfit collar is engineered to naturally expand to foot shape to ensure supportive fit while an anatomical upper mimics a barefoot experience. The new Fuse Skin is an evolution of the COPA’s classic leather treatment that features a seamless and less permeable skin, re-defining touch for a football boot. The K Leather itself is super soft, providing optimal comfort and touch. The X Ray Vamp brings the foot closer to the ball and reduces slippage. The Purecut laces remove unneeded layers to maximize ball control area. The design of the COPA19+ is also engineered to maximize movement and feel. The Comfortframe stabilizes movement and enhances traction. The two footshape inlays allow optimal cushioning. The stud positioning and shape have been designed to optimize rotation. Have you incorporated any new materials? With touch such a key focus of this boot, we spent a huge amount of time developing the new upper to ensure it delivers unparalleled touch and control when in contact with the ball. That includes use of our new Fuse Skin, which is an evolution of the existing K Leather technology. It is a re-imagining of the COPA’s classic leather treatment and it delivers a seamless and less permeable skin. The material is super soft, providing optimal comfort and touch. How does the boot fit into the adidas mantra of authenticity to progress? Authenticity to progression’ is all about being inspired by classic design of the past while simultaneously embracing the technical innovation of the future. The COPA 19+ undoubtedly lives up to that mantra. The design is born from the iconic and classical look of the original Copa that is loved by football purists. However, it has been re-designed and re-engineered to deliver unrivaled performance and take inspiration from the style preferences of today’s football consumers. It is our most progressive boot to date. What is the difference between the COPA and the other adidas boot silos? Where the Predator is all about control, the X all about speed and the Nemeziz all about agility, the COPA 19+ is built around touch. Every element of the design is constructed to maximize touch, allowing the game’s most skillful players to control the ball and bring out the very best of their own game. You talk about being an innovative brand, however by bringing back a boot as classic as the predator, how is this innovative? We firmly believe that innovation isn’t about simply throwing out the designs of the past and ripping them up every few years to be replaced with something new. At adidas our heritage in football is unrivaled, and this heritage informs all our designs. So, while all our products push the boundaries of new technology and new design, they are also inspired by the elements of football design that fans of loved for decades and remain popular today. How exactly will the new COPA improve player performance? The new COPA 19+ will support the game’s best players with technology that helps them in three key areas – fit, touch and movement. The internal construction, featuring foam pads and an ortholite sockliner, provides cushioning and comfort for a secure and comfortable fit. A Sockfit collar is engineered to naturally expand to foot shape which delivers a supportive fit, while an anatomical upper feels almost as if you are barefoot. The Fuse Skin is an evolution of the COPA’s classic leather construction. It that features a seamless and less permeable skin, making a huge difference in terms of touch. The material is super soft, providing optimal comfort and touch while the X Ray Vamp brings the foot closer to the ball and reduces slippage. The Purecut laces remove unneeded layers to maximize ball control area. The design of the COPA 19+ is also engineered to maximize movement and feel. The Comfortframe design stabilizes movement and enhances traction while the two foot shape inlays allow optimal cushioning. The stud positioning and shape have been designed to optimize rotation. Again, you can find all latest COPA 19 releases available at soccer.com.